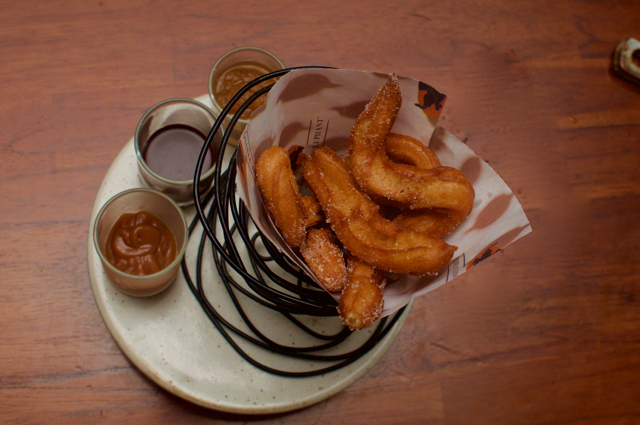 The best way to dismiss Churros is to call it 'simply fried dough.' Remember though that some of the greatest pleasures in food are simple things done well. Simple things done shabbily are more the norm now. Churros is not native to India, so there is no reason why it should be on menus when the art of destroying the dish is so easy to master. And then it will be called fried dough. Duh! Thankfully, one place, and so far ONLY one place in Chennai has managed to keep the Churros flag flying. At least every time I've had it, it has been done to near perfect. Flying Elephant's Sunday brunch is one where you get caramel, chocolate sauce and a beautiful apple cinnamon kind of dip to dunk you churros in. And slowly revel. Anyways. As you might know, I hate buffets and Sunday brunches are no different. Circa 2008-2012 (yeah, I know, it is not very long ago), brunches cropped up in the city and the torch bearers did a great job. The crowd joined in and brunches were reduced to large poor quality lunches with number of dishes becoming the selling point. And I've stayed away for the most part. Being invited for the Park Hyatt's chefs on tour closing brunch where three exec chefs were around was the perfect way to start my rediscovery of the city's brunches. While I've always spoken about this restaurant and the hotel's penchant for quality over quantity, they've taken that philosophy to their brunch. While there were many excellent dishes, I can pick a few of them that stood out. And if you have eight great dishes, it wouldn't matter if the rest of the brunch had only ten of if it had three thousand dishes to choose from. But you need to get those eight right! Park Hyatt Hyderabad's super tall chef served up a black risotto on the lines of the ones you get in Las Vegas. 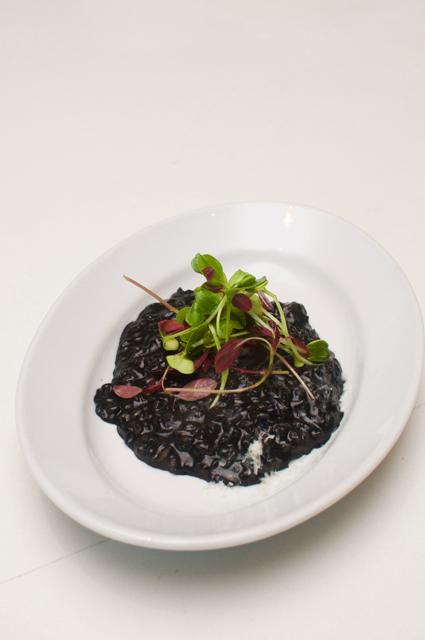 Perfect al dente rice with the bite, squid ink to give it both the blank colour and whiff of the flavours of the sea, parmesan cheese giving it that cheesy flavour, combined to give you a burst of flavour in your mouth. Chef 1. Check. 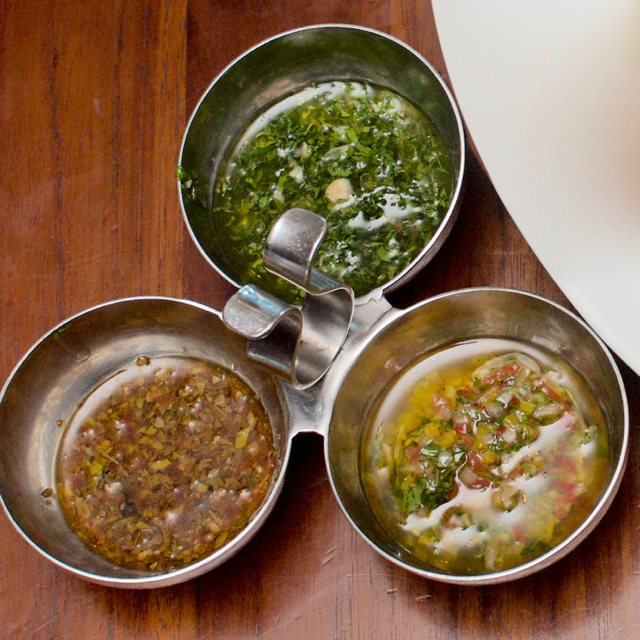 Park Hyatt Goa's executive chef is an Argentinian. Which probably explains why the Argentinian grill counter replaced the usual grill they have. I've not had Argentinian cuisine, but I certainly didn't need to know the cuisine to enjoy this grill plate. I asked for a lamb chops and prawn grill from the live counter. 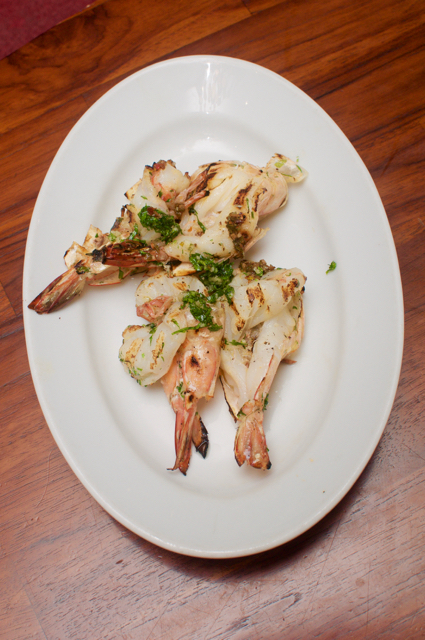 The beautifully frenched lamb chops arrived clean with a plate of beautiful prawns. Just grilled with almost nothing on it but the three sauces that they were served with did all the magic. Flavours of cinnamon, greens and sweet all for you to choose and mix n match. Chef 2. Check. What I was looking forward to the most was Chef Teku's counters. I haven't really had a chance to have his food and his Asian counter was a feast to the eyes. The Ayam Gravy with white rice and the Nasi Goreng served on the table were all I had from him. All I needed to get my Asian fix for the day. 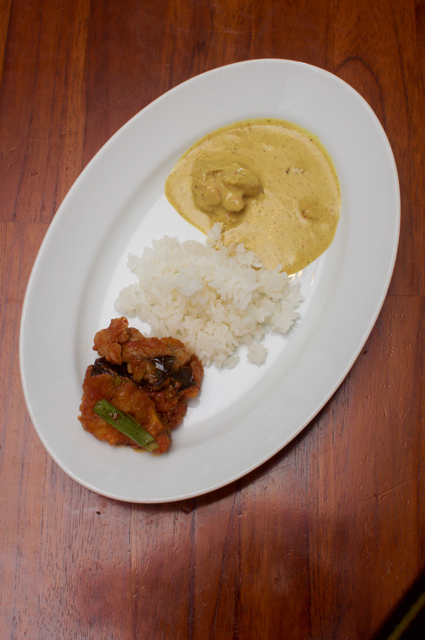 The Ayam gravy was rich with classic Asian flavours and a strong coconut base with beautifully cooked and flavoured chicken. 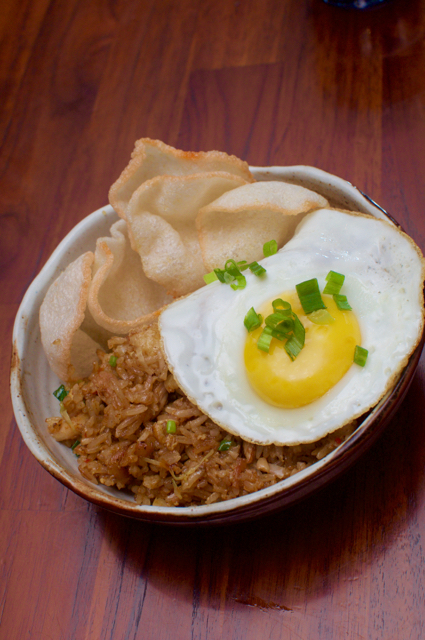 The Nasi goreng was brave with the strong Malaysian scents and prawn crackers with the fried egg. This was a true brunch with breakfast options and we loved the runny yolk (Ok, I loved) on an English muffin with hollandaise sauce and spinach. The Egg Florentine, one the of stand out dishes of the breakfast at Park Hyatt makes an appearance in the brunch too. Dessert. Now, this needs a separate blog post, but I am going to attempt to sum it up. Simply, the best spread of dessert in any buffet in Chennai. Again, not my the number of dishes, but by the quality. The shabby looking green dish on the platter was the best of the lot. Asian pancakes with coconut filling. With flavours of Pandan (or was it something else?) steeped well into the batter giving it the green colour and the coconut stuffing playing the perfect folly to balance the dish, this was the pick of the day. Oh, did I talk about the Churros? 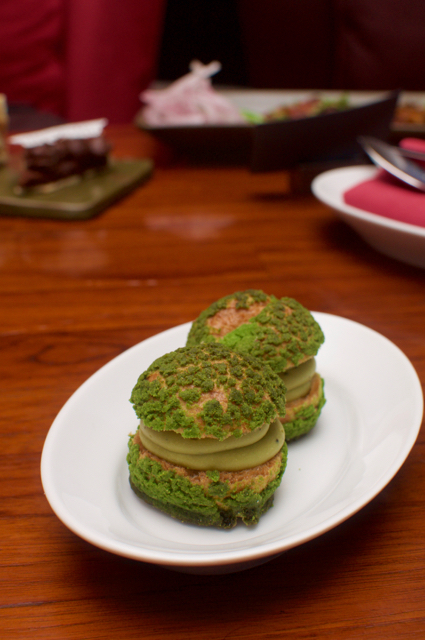 The Matcha Green tea profiterole was a super clever dish. 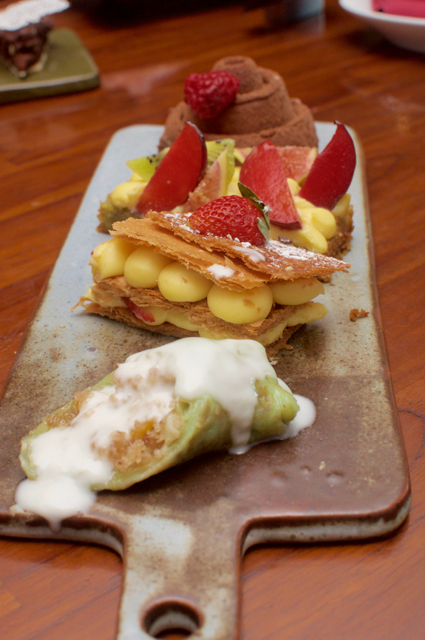 Everything you like about the profiterole like the chewy cheux pastry with a creamy filling, the matcha green tea flavours added a nice new dimension to the classic, with the tea cutting through the sweetness. I could go on about the other dessert and the other things I ate, but if you have these on your buffet, you've got a great buffet. Oh, you can use the roof top infinity pool till 6 pm while the kids can play in the specifically designated kids zone, complete with balloon makers, so this is like a perfect family day out! The non alcohol brunch is priced at Rs. 2650 net and they also have alcoholic and champagne brunch options.